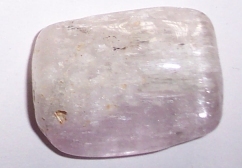 Kunzite is worn or held to induce relaxation. It releases tension and soothes stressed muscles. It calms anger, nervousness and fears. It is also reputed to useful for attracting love. Kunzite is an effective grounding stone Avoid exposing kunzite to sunlight for long periods - this may cause the colour to fade.